If you're new to Qorus, and wondering where to start, well, look no further. In this Quick Start Guide, learn everything you need to know to get going, and become more productive while you work in Office 365. 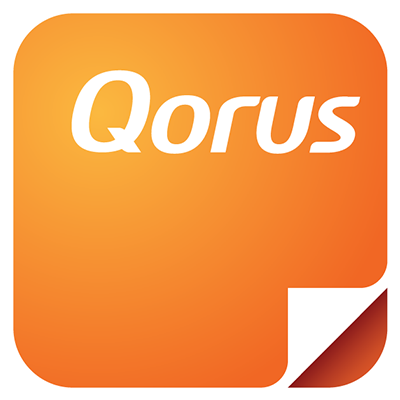 If you haven't signed up for Qorus yet, then you can do that after you've installed any one of the Qorus Add-ins, by simply following the sign up wizard and using your Office 365 login credentials. If you're not sure if your computer is ready for Qorus, or if you can use Qorus with your Office 365 subscription, you can find information about the requirements for using Qorus here. Qorus will automatically connect to OneDrive for Business, so you can get going right away without having to configure or setup anything else. If your organization is using or considering to use SharePoint Online, you should know that you can also connect your libraries and lists to your Qorus Hub - making Qorus your 'one stop shop' for the content you need while you work in your favorite Office 365 apps. Plus, you can save searches to your favorites for even quicker and easier access to your most frequently used content. 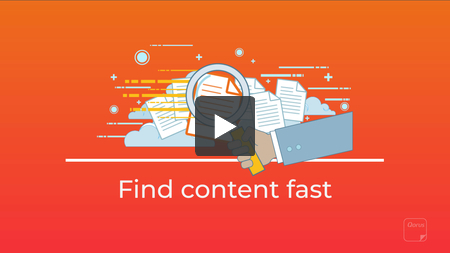 For more information on how to locate your best content fast, click here. Qorus offers so many different ways to work with the re-usable content you locate with Qorus, and to boost content efficiency. 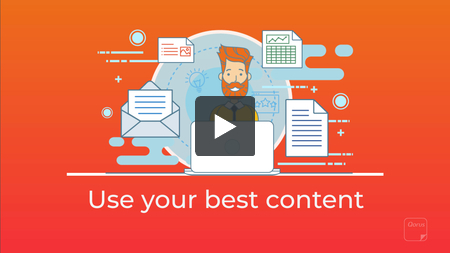 What would you like to do today to boost your content efficiency? In just one click, you can insert content directly into emails, documents, presentations and spreadsheets using the Qorus Add-ins . The Qorus preview allows you to do more than just view the contents of a document without downloading it first. It's interactive too, allowing you to do things like search within the body of a document, select the parts you need, and insert your selection. You can directly open and edit Word documents, Excel spreadsheets and PowerPoint presentations. Any edits made can be saved back to OneDrive for Business and SharePoint Online, provided you have edit rights to that content of course. With Qorus for Outlook, you can attach one or more files to emails at once, and you can even choose to have Qorus convert them to PDF. When you insert Smart Word content that contains Smart Fields and Rules, you get the Smart Insert - allowing you to save loads of time and personalize the Word content you insert into emails, documents, presentations and spreadsheets. By Smart Content, we mean content that contains Smart Fields and Rules. Smart Fields are used to collect information about the business context, and instantly find and replace placeholder content. Smart Rules use the information collected by Smart Fields, to adapt messaging to suit the business context, and only include the parts that are relevant and will resonate with your audience. Select and add PowerPoint slides to the Qorus Cart, then assemble them into brand new presentations. You can add all the slides in a presentation to your cart, or pick and choose the ones you want to re-use. It also works with Smart Fields and Rules, allowing you to personalize your new slide deck while you're assembling it. Turn any document, presentation or email into a template with Qorus, and use them as a basis for creating new ones. Plus, if your Word and PowerPoint templates contain Smart Fields and Rules, then you can personalize the new files you're creating at the same time. Clean up your document before distributing it, and automatically remove all the content controls that keep track of the refreshable content in your document. Instead of rewriting the same answers to the same questions every time, write them once, and then use the Qorus Clip to save those answers as brand new documents to SharePoint Online and OneDrive for Business. Then the next time you, or one of your co-workers, need an answer, you can use Qorus to easily find it, and insert it into emails, documents, presentations and spreadsheets. Qorus makes it easy to stay on top of change, and collaborate more effectively, with the help of document assignments. You can for instance assign a question from an RFP to a subject matter expert, or a section of a complex document for someone to review. Qorus creates 'to-do' lists, tracks progress towards due dates, sends email notifications, and provides insights into how well people collaborate in your Qorus Hub. You can learn more about enhancing your collaboration workflow with Qorus right here.